Beatrice Caudle was greeted into Heaven by her husband and family and friends on Wednesday morning, August 29. Beatrice was born on September 4, 1916 in Roane County, Tennessee to Joe and Bettie (Cofer) McKinney. She was a 1933 graduate of Roane County High School. Beatrice married Howard Caudle on March 20, 1936. He preceded her in death on June 15, 2007. After their marriage they moved to Indiana, living most of their lives in the Fountain City area. Beatrice was a long-time member of New Garden Friends Church. 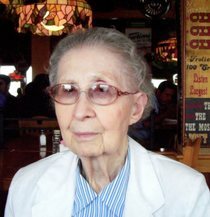 She was a Sunday School teacher of preschool children for many years. She also served in a variety of positions in the church. Beatrice was a homemaker and enjoyed spending time with her family. On Beatrice’s 100th birthday, her family also celebrated five generations. Beatrice is survived by two daughters & sons-in-law, Marjorie & Fred Madden and Carol & Duane Petry; grandchildren Vickie (Dennis) Centers, Pam (Bryan) Eddy, Lori (David) Goldberg and Mark (Katya) Petry; step-grandchildren Jana Pehler, Lisa (Steve) Higgs and Rick Madden; several great-grandchildren, one great-great-grandchild and nieces & nephews. Beatrice was preceded in death by her husband, parents, and 10 brothers and sisters. Beatrice’s family would like to thank her caregivers over the past nine years. John Myers will conduct a funeral ceremony at 1:00 p.m. on Saturday, September 1, at the Smith-McQuiston & Webster Funeral Home, 321 US 27, Fountain City. Interment will follow in Willow Grove Cemetery. Family and friends may gather for visitation from 11:00 a.m.–1:00 p.m. on Saturday, September 1, at the funeral home. Memorial contributions are encouraged for World Vision, P.O. Box 9716, Federal Way, WA 98063; Salvation Army, 707 South A Street, Richmond, IN 47374 or St. Jude Children’s Hospital, 262 Danny Thomas Place, Memphis, TN 38105.